The Annual Awards Dinner, held each summer, hosted by the Washington International Trade Foundation, is WITA’s signature event. The Dinner attracts hundreds of top decision makers, policy shapers, and trade experts from D.C. and around the world. The Dinner provides an excellent opportunity for members to connect with other trade professionals, business leaders, and dignitaries in a celebratory setting. 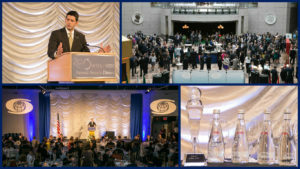 Organized by WITA’s sister organization, the 501(c)(3) Washington International Trade Foundation (WITF), the Awards Dinner is the biggest trade event of the year in Washington, DC. The event is a fundraiser to support WITA and WITF’s trade education activities throughout the year. This event is considered “widely attended” under both House & Senate Gift Rules. Members of WITA are high in attendance as well as some Non-Members. The highlight of the evening is the presentation of our various awards, such as the American Leadership Award and the Congressional Leadership Award, given to individuals who have made extraordinary contributions in the field of international trade. Past honorees (listed below) have included Members of Congress, Senators, United States Trade Representatives and other Cabinet and Sub-cabinet level officials. Another tradition at the Dinner is the honoring of an impactful individual in the trade policy community with our Lighthouse Award. Kept secret until the night of the Dinner, the Lighthouse is awarded in recognition of the contributions the individual has made over the course of his/her career to trade policy, the understanding of global trade, or expanding the benefits of global trade. Prior recipients can be found at the bottom of this page. The pre-event cocktail reception is located in the gorgeous 8-story atrium of the Ronald Reagan Building and International Trade Center, beer, wine, and spirits from around the globe, post-event festivities and desserts, and our famous gift bags for all attendees. The Annual Dinner is packed with a ‘Who’s Who’ of trade policy professionals–over 500 attendees each year. It’s no wonder it’s come to be known as ‘Trade Prom‘. *Free passes not available for use at all WITA events. After free passes are used, event member rate applies. For a personalized invoice, please let us know! See our 2018 Annual Awards Dinner Highlights here. See our 2017 Annual Awards Dinner Highlights here. See our 2016 Annual Awards Dinner Highlights here. See our 2015 Annual Awards Dinner Highlights here. WITF is the 501(c)(3) organization that supports the educational mission and activities of WITA. WITF’s Federal Tax ID Number is 52-1907420. To calculate your charitable contribution amount, deduct the amount of the table and the group membership from your Investment amount above. Thank you for supporting WITA and WITF by sponsoring a table at the “Trade Prom”! All checks should be made payable to the Washington International Trade Foundation. To download a Word.Doc copy of the 2019 Sponsorship Information, please click here. To download a PDF copy of the 2019 Sponsorship Information, see below.